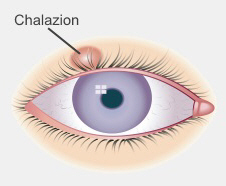 A chalazion often goes away by itself within a month or so. To help it go, put a clean, warm compress on your eyelid four to six times a day, for about 10 minutes at a time. Also, gently massage the lump with clean hands, for several minutes each day. This softens the oil in the gland and can help it to drain. Don't try to squeeze or drain the chalazion yourself. If it keeps getting bigger or doesn't go away, see your GP to get it checked. In most cases it will be OK, but very occasionally it may be cancerous. You may need a biopsy to check. Even if it's not cancerous you may want minor surgery to remove it. See your GP. Or you may choose to pay to see a private ophthalmologist. Surgery to remove a chalazion is usually done with a local anaesthetic injection and from the inside of your eyelid, to avoid a scar. However, children may need a general anaesthetic. You will need someone else to drive you home. When the anaesthetic wears off you will have some pain – take pain relief medicine such as paracetamol if you need it. You will have some swelling after surgery, but it will slowly get better. You may also bleed a little. If the wound continues bleeding, even after you apply pressure with a pad, see a doctor. Styes usually get better on their own within a week or two. Generally you won't need any treatment. If the stye has formed a head, it will burst and then the stye can settle. Applying a clean warm compress four times a day, for 10 minutes at a time, can help bring the infection to the surface. Don't try to squeeze or drain the stye yourself. If the stye is large or if it doesn't settle by itself, your GP may need to cut it open and drain it. People with blepharitis are at more risk of styes. Read about how you can look after your eyelids to help treat blepharitis. American Academy of Ophthalmology – What are chalazia and styes? This section explains what causes chalazia and styes, the symptoms, and treatment.